This creamy soup showcases autumn’s bounty and is an absolutely delicious, supremely healthy treat. Heat oil in a stockpot over medium-high. Add diced vegetables and cook, stirring, 10 minutes. Add remaining ingredients and stir to combine. Raise heat to high and bring to a boil. Once boiling, reduce heat to medium-low, cover and simmer 1 hour, stirring occasionally. 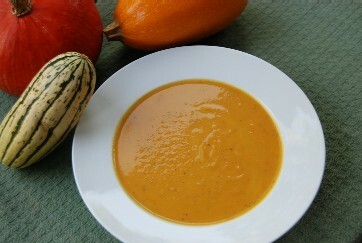 Remove from heat and puree using an immersion blender, conventional blender or food processor. Serve immediately.